Your vehicle has been damaged. Now what? If you’ve never had to deal with minor or serious vehicle damage, you may not know what to do after a car accident happens. 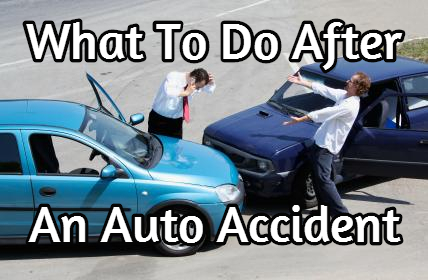 That’s why it is important to take some time to review the following tips on what to do after a car collision so that, if you find yourself involved in a collision or other accident, you’ll be better prepared to handle the situation. Perform an on-the-spot health assessment of everyone involved. Start with yourself. Take stock of your physical condition and ensure you’re well enough to get up and walk around. Next, check on your passengers before taking any further steps. Get out of the way. Get uninjured passengers out of the vehicle to the side of the road, safely away from the vehicle and oncoming traffic. If you suspect that anyone’s been injured at all, get on your cell phone and dial 911. Turn on your car’s hazard lights to alert approaching traffic and prompt them to slow down. Call 911. If you don’t have a phone with you, ask a bystander to call for emergency medical services. Even if the damage to your vehicle is minor and even if nobody’s suffered any injuries, it’s important to have the police complete an official report—in some states, it’s a legal requirement. Document the scene. While you’re waiting for the police to arrive, take pictures of the accident scene, all the vehicles involved and any injuries; jot down notes so you have a detailed record of what happened. Taking photos can help protect you against the possibility of the other party trying to alter the scene, changing the story of how the accident occurred, or even leaving before the police have arrived. The names and addresses of everyone involved the driver, passengers, and any witnesses to the accident. The driver’s license number of the other driver. The name and contact information (including phone number and address) of the other driver’s insurance company. Note any policy numbers found on the driver’s proof of insurance card. Take down the license plate number, make and model of every car involved in the accident. Find a collision center. As the owner of a motor vehicle involved in an accident or submitting an insurance claim, you have the right to choose the collision shop where you wish to have your vehicle repaired. If you choose to receive multiple repair estimates, keep in mind that estimates may vary based on the quality of work that will be done. A too-low estimate may not repair all of your damage, and while your car may look nice and drive well for a short time, these repairs may not provide a long-term solution. Research accident shops in your area and ask around for collision center referrals. Report the accident to your insurance agent or company within 24 hours. After an accident, your insurance company will need to be contacted before any repair work can be done. Your insurance company cannot dictate that you have your vehicle at one of their preferred facilities. The collision center you choose should work with all major insurance providers and can contact them on your behalf, if you choose. If your car is damaged while parked, by hail or any other situation, follow the same requirements and report it right away. An accident can leave even the most seasoned driver frazzled, but following these steps can help protect you against unnecessary worries and will give your insurance company enough detailed information to begin processing your claim as smoothly and as quickly as possible.